On this Earth Day I am thrilled to announce that Marcy Browe Photography has been included in the Green Oceanside Business Network!!! Green Oceanside Businesses are recognized as environmental leaders that incorporate sustainable practices. 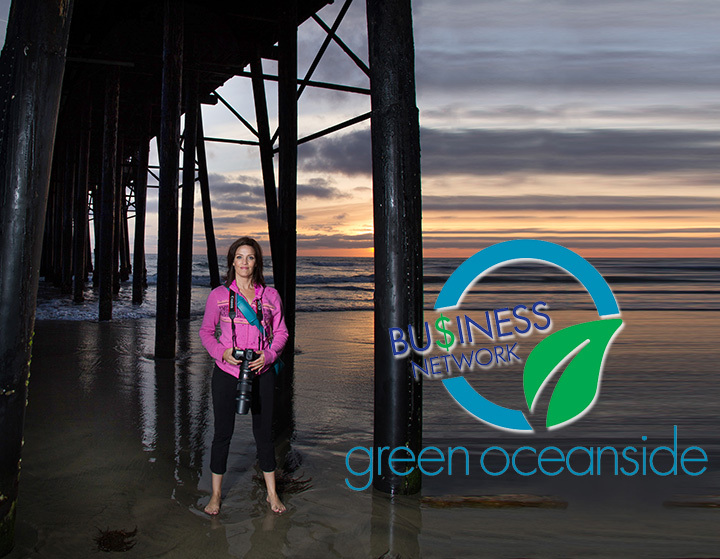 The Green Oceanside Business Network was created to spur innovation and environmental responsibility while helping Oceanside businesses prosper in the green economy. I take pride in running an environmentally conscious business and I provide my clients with beautiful, sustainable products. Working with businesses and vendors who comply with environmentally conscious, sustainable practices is VERY important to me, so I proudly use Bay Photo Lab for all my my photo printing and photo products. They received a Green Business Certification Award for “exceeding environmental regulatory requirements, preventing pollution, and conserving natural resources!” So you can be confident that your prints will look amazing and you’re doing your part to help Mother Earth. I have an upcoming blog post all about green resources for photography, so stay tuned! Before I turned my photography business into a full time career, I was working in corporate America and I was constantly frustrated by the incredible amount of waste I witnessed throughout the company and the unnecessary air travel that happened on a regular basis. I told myself that when I had my own business I was going to make every effort to be as sustainable and environmentally conscious as possible. So now that I am a business owner, I am very proud to tell my clients that when you work with me, you can feel confident that we are making beautiful and sustainable memories together.